Four hours on the bus went by way faster than I thought it would. It helped that throughout the entire trip, when the engines started up, I conked out. Seriously. The cool bus, the seat that actually reclined, the footrest, the motor noise... I had a really really hard time staying awake to watch all those great movies dubbed in Spanish we kept being treated to; in this case, Christmas with the Kranks and A King's Ransom. What? You've never heard of "A King's Ransom"? Yeah, well, there's a reason for that. The movies though, really helped illustrate the drastic differences between life in the States, and life in Mexico. The Christmas movie featured a neighborhood with matching 4-bedroom, brick colonial homes, neatly landscaped, with a nice car in each driveway. The gluttony and material wealth of Americans was in such contrast to life in the the small towns we were driving by where all the homes were tiny, concrete block structures. Not a two car garage or Starbucks in sight. We landed in Merida around dinner time and took a taxi (40 pesos) to the hotel we had lined up (350 pesos). Cash only, we were told! Moon told us that the owner was an "absolute delight!" She didn't speak much English and she pretty much avoided us, but I'm sure she was delightful when the travel guide people were sniffing around. My heart sank for a second when we pulled up to the hotel. It was really cute from the outside, but surrounded with what appeared to be vacant buildings or businesses or something, so the street was dark and definitely not alive and thriving. During our stay there, I got more comfortable on the street at night, but was still always extra alert just because it was a bit sketchy. The hotel was really cute from the inside too - landscaped courtyard, rocking chairs, little pool... The room, eh, it was ok. The twin beds in the room felt like they were made out of plywood with a thin layer of worn out padding on top. We had air-conditioning though. A pool, a.c., a bed that wasn't a bunk and my own shower for about $25 bucks a night (12.50 actually when you split it)? Not too freaking bad. It took me a little while to get used to the street architecture in Mexico - lots of beautiful places, hidden behind an ugly, flat concrete wall with no windows. I'm sure there is some reason that buildings were designed that way and someday, maybe I'll remember that I'm curious about it and look it up. But until then, I'll just say that it was kinda weird. But so interesting to walk through a boring concrete wall into open, landscaped courtyard. The first night, we just kinda walked around the neighborhood and found food and drink. Food not so good; drink not so great either. But, we did get to sit on a little balcony and just people watch. Its so nice to just be able to sit and watch. I never can sit still that long here without feeling guilty about it. The plaza was built by the Spaniards, when they came in and conquered the natives. What I thought was the most tragic (resourceful?) was that all the gorgeous Spanish colonial buildings around the plaza were actually constructed from stones taken from the Mayan temples that were previously there. At least, that's what the tour guide said anyway. In one of the better examples of the brutality of men, the entrance of the palace that housed the main family that came in and killed all the natives is adorned with statues of the Spanish conquerors. So, you ask? The Spanish statues were each standing on a beheaded head of a native. Gross. What is it with ancient cultures and beheadings? After our romp around historic downtown Merida, we set off to find the post office and the market. It was brutally hot. Did I mention it was in the low 100's when we were down there? And the market was a zillion miles away. Yes. A zillion. And that's why it was so very annoying when the Moon Guide struck again! The very pretty building that used to house the post office, and that was shown on the Moon map, had been sold off to the cable company. Or maybe the bank. I forget - their logos were kinda similar. The new post office, we were told, was pretty far away. Needless to say, we didn't make it there. Moon did correctly point us to the market though. What a place. I can't even really describe it, except that I felt like a PBS camera should be following me and that I should occasionally pick up something inedible and try it. 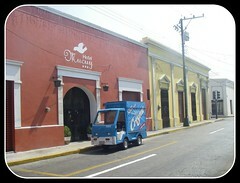 Although we were still in a major city, we were well out of the cultural and tourism center and into real life Merida. We were the only gringos anywhere. There were lots of beggars. And not your ordinary run of the mill kind; people with serious, nightmare inducing handicaps and mental disabilities. Say what you will about the American health care system: we do a pretty good job of keeping the truly disabled off the street and cared for. We wandered around for quite a while and bought some fruit that we had never had before, and even though you aren't supposed to buy pre-peeled fruit, we bought a big bag of mango. Yum. Yum. Yummy! Walking around Merida was kinda tricky. It was loud. Loud. Loud. Loud. I'm still puzzled as to why so many pharmacies needed to have large speakers pointed towards the street, pulsating obnoxiously. Cars beeped; diesel engines roared. Music blared. All. The. Time. The sidewalks were also ridiculously skinny. Room enough for one person to walk comfortably; room enough for a person to pass another person without too much stress, but not wide enough to accommodate late-afternoon shopping and people leaving work. We mostly had to walk in the street, putting us closer to the diesel fumes. Ugh. We had two more things we wanted to accomplish that first day: the art museum and the anthropology museum. By the time we had pushed our way through the crowded sidewalks and washed the mango off our sticky fingers, the art museum was closed. But we still had time to get to the anthropology museum, according to Moon. Wrong again Moon!! Moon told us that the anthropology museum was open until 8pm. Where the hell did they get that idea?! I think we got there around 6; and we wandered around and around and around looking for the building. We were in an area with a wide boulevard and many large old colonial estates (more American style excess). Back and forth we went; looking for the big sign that said Museum. Silly us. We had passed it and ignored it because it was closed. We were looking for the open museum!! Well, for the record Moon, the museum really closes at 5pm. Oh, Moon also told us about all the free cultural activities that happen in Merida each night - free music here, folk dancing here.... Well, we tried to find these things too, but to no avail. So we were thwarted several on the first day. We recovered, but it sure would have been nice if everything had fallen into place a bit better. We must have walked at least 5 miles that day, maybe more, in 100 degree heat. And I don't really remember eating anything of consequence. Its so funny though - how much stuff I think is necessary to cram into one day of vacation. If you suggested to me that I get up early to do a walking history tour, walk to a farmers market, go to TWO museums, then watch folk dancing my answer would involve asking you if you were on drugs, a snort, an F-word and a resounding no. But on vacation, sure!! It sounds perfectly reasonable!! Required, even. Up next: we wake up at 5:30 am to take the 6:30 bus to Chitzen-Itza. *chuckle* Quick question... What year was the Moon book written? 2009!! I swear to you! It just illustrates the value of having TWO different guidebooks. I think that the concrete walls sans windows is supposed to be cooler but don't quote me on that one.